There is nothing guaranteed to get a business executive hot under the collar than a little bad punctuation. Not everyone is great with it but most of us know the value of checking before we send something out or get that sign printed. 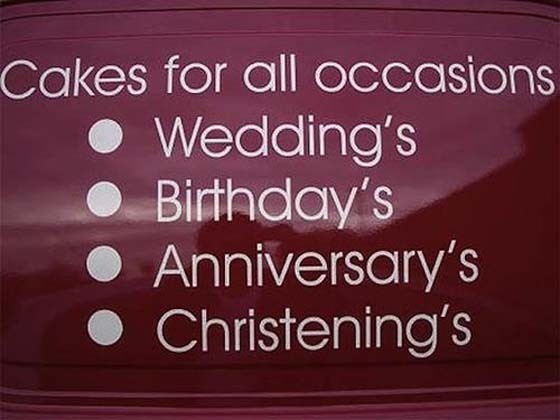 Take this sign for a cake decorating service that seem’s to think apostrophe’s should go everywhere. Our top tip for business ecards? If you aren’t 100% sure on punctuation then check before you send or sign off. Get someone you trust to check and then…check again. Alternatively give us a call and we’ll offer our expert advice.